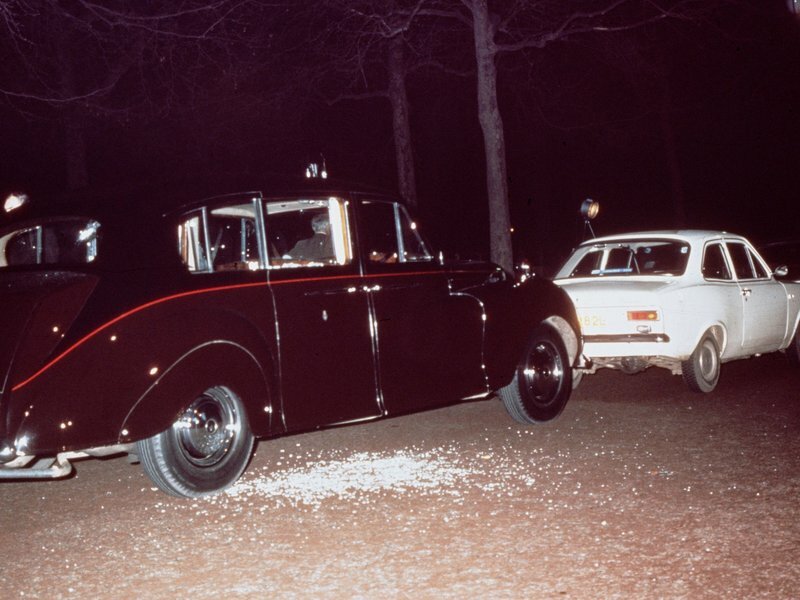 On 20 March 1974 Princess Anne and husband Captain Mark Phillips were returning to Buckingham Palace after watching a charity film presentation when a car overtook their Rolls-Royce. It pulled in front forcing the royal vehicle to stop. The princess’s bodyguard, Inspector James Beaton, pulled his Walther PPK automatic but the driver of the car Ian Ball had already drawn his .38 revolver and was pointing it at Alec Callender, the princess’s chauffeur. He approached Anne’s window and said, “I want you to come with me for a day or two, because I want two million. Will you get out of the car?” Anne replied, “Not bloody likely — and I haven’t got two million.” Ball shot twice at Inspector Beaton, hitting him in the shoulder. Then Callender grabbed Ball who responded by shooting him in the chest. Ball grabbed the princess’s arm and told the policeman to “Drop that gun, or I’ll shoot her.” As Ball yanked at the princess, Captain Philips grabbed her round the waist, heaved her back into the car and he managed to close the door. Ball then shot Inspector Beaton in the stomach. PC Michael Hills, on duty at St James’s Palace, rushed over and was also shot in the stomach. Passers by joined in the fracas. Journalist and writer Brian McConnell approached Ball “You can’t do that, these are my friends. Don’t be silly. Just give me the gun.” Ball shot him in the chest. Ronald Russell, another passer by, punched Ball in the head and he aimed his gun at Mr Russell but missed. Ball made a run for it but was rugby-tackled by Detective Constable Peter Edmonds. In seven minutes 11 bullets were fired and four people injured. On 22 May Ball, who was a 26-year old schizophrenic, appeared in court charged with two counts of attempted murder, two of wounding and one of “attempting to steal and carry away Her Royal Highness Princess Anne”. Ball was detained under the Mental Health Act. Inspector Beaton was awarded the George Cross; PC Hills the George Medal and Callender, McConnell and Russell the Queen’s Gallantry Medal.